Within 250 miles of Taunton, MA. 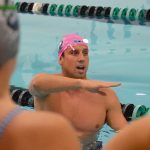 Two-Day Swim Camp! Sign up for one or SAVE by signing up for both sessions for your swimmer’s age group! The curriculum for this camp is all about racing faster in both butterfly and breaststroke races. Your swimmer will work on their open turns, underwater dolphin kicking, and breaststroke pullouts on Saturday. Then on Sunday, the curriculum will focus on technique for fast and efficient butterfly and breaststroke. Leading each session will be Elite Clinician and National Champion Tom Luchsinger! Tom is a very effective and attentive clinician. Scroll down for more details on the curriculum. Races are often won and lost because of the quality of turns and underwaters of the competitors. Many people don't realize this, but the push-off and streamline from the wall after a turn SHOULD BE the fastest a swimmer will go while in the water other than the streamline after a dive. Even elite level swimmers often add in extra movements on their turns that slow them down and even cause them to lose races that they could have won. At this session, National Champion Tom Luchsinger will work with each participant to maintain their momentum at these key points in a race. BREASTSTROKE PULLOUTS: The best breaststrokers are faster under the water than on the surface! Learn the components and sequence of movements that make up a fast underwater breaststroke pullout from Tom Luchsinger. 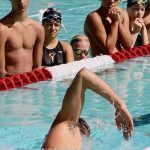 With the proper body position and timing, a swimmer's pullout will take them almost to the other side of the pool faster than you could imagine!